Our conference is held right in the heart of the Dublin City Centre at the Royal College of Surgeons in Ireland’s (RCSI) main two campuses. As students and members of these neighborhoods, we enjoy taking time out of our conference preparations to give back to the local Irish community. On October 6, 2018, members of the ICHAMS Organizing Committee hosted a successful bake sale at RCSI. We raised over €250 for Pieta House, a non-profit organization in Ireland. Pieta House provides free professional counselling services to those who are in suicidal crisis or bereaved by suicide. This is a cause near-and-dear to our hearts and we felt the values of Pieta House were well-aligned with ours. Thank you to all who helped to make the bake sale a success! If you have thoughts of self-harm, you can contact Pieta House 24/7 at 1800 247 247 or text “HELP” to 5144. 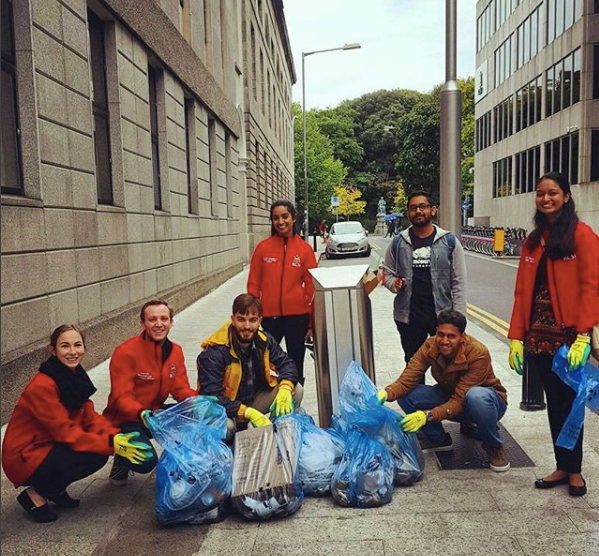 In Fall 2017, our organizing committee braved the cold rain with garbage bags in hand to help make the community surrounding RCSI a little cleaner. Over the course of a few hours, we collected numerous bags of trash from city streets and parks in the area.